Add all ingredients to a shaker, shake dry (without ice) to emulsify the egg whites. Add ice and shake. 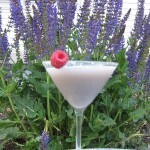 Strain into a chilled martini glass, garnish with a raspberry.